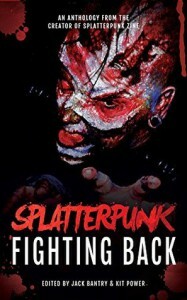 The definition of "splatterpunk" should give an idea of what this volume entails: characterised by the explicit description of horrific, violent, or pornographic scenes. With an abundance of monsters, gore, and sexual tones, it stays true to the nature of the sub-genre. My advice? Just be prepared. I never would've known about this analogy had I not joined the one and only Horror Aficionados on Goodreads, and took part in their January group read with author invite. Being new to the horror sub-genre of splatterpunk, I expected that it would probably involve some disgusting and gruesome "what the hell did I just read?" moments, and I quickly discovered that I was correct. I enjoyed some stories more than others, however as a whole I consider it a great piece of horrifically violent and graphic literature. Listed below are each individual tale, starting with my most favourite. I also thank the authors for being so pleasant to talk with, and for donating all proceeds of sale to charity. Check out my blog to see the Q&A with some of the authors. Even this quick glimpse into this forsaken world left me completely engrossed. A twisted, bloody apocalypse? My cup of tea any day of the week. The Cthulhu-theme fascinated me, as I've actually never read any such thing before (I know, shame on me). Even though it was short, and seemed to drop the reader right in the middle, I was immediately pulled into the maternal desperation of the protagonist, as well as that drive of trying to keep the madness at bay. I loved every gruesome detail and the sheer brutality. Victims fighting back - it's a particular favourite of mine. This one actually began as rather typical, reminding me of the whole Texas Chain Saw Massacre trope, yet it turns into something else entirely. The inclusion of the "Sasquatch" type monsters made my skin crawl, as I suspected the family had a rather... intimate relationship with them. Definitely images I didn't need in my head. This one made me think a lot, admittedly a bit more in comparison to the others. There's a belief that we all have it inside ourselves - an animal, primitive, left over from our ancestors. What if that gets tapped into? Even good people can do bad things, and we all have unwanted thoughts that seep to the forefront sometimes. I found Spencer's journey to be fascinating, and I couldn't help but want a full-length novel. A classic, isn't it? The monster in the closet, or beneath the bed. I really liked this one and, sure enough, the monster creeped me out! It made me think about how we so readily dismiss children when they speak of monsters or other such creatures that don't fit into our notion of reality - no wonder it's been the plot of so many books and movies. Also, poor Darla. If it's one thing I love, it's mythical creatures, especially when an author involves their own personal twist. Ana was portrayed with such raw sexuality, and I loved the hold she had over the men in her midst. This one in particular sparked my imagination; I couldn't help but ponder over Ana's origins. She struck me as an apex predator, but also something more. Ancient. Malevolent. Like at one point in time her kind were respected and feared, yet they faded away into nothing but stories and superstition. Well, this one certainly took religion to the extreme, and delved into the sheer insanity of two individuals. Being an atheist myself, I wouldn't want to get on the Robertson's bad side. Really, I think the couple would've been better suited to the good ol' days of when atrocities in the name of religion were the norm. Whilst I enjoyed it for what it was, it lacked in something to really make an impact. The ending was good, though! To think if we lose a part of ourselves, a piece of our soul goes with it. Despite the added humour to the otherwise eerie tone of this one, I didn't favour it as much as the majority of other readers. Disembodied limbs generally don't interest me all that much. My partner has pediophobia and while I often tease and laugh, I admit that there's something unsettling about dolls. It's the uncanny valley, right? I was left with a lot of questions regarding Molly, and I would've liked a bit more information for the events that transpired to make sense. She was able to clean up after her own murders? I felt like there was perhaps too much telling and not enough showing. I admit, this one made me laugh, but there was a tinge of discomfort below the absurdity. The detail was disturbing - such as Claudia's skin darkening from her insides being torn apart. It makes me shift in my seat when I think about it even now. The ending? Well, it was a great ending. However, despite my brief flare of enjoyment, I can't say I favoured it highly. I get the impression this was supposed to be intentionally hard to follow - as it was a piece written by the character himself, of whom was a very intense and unstable individual. I had to read it twice, and still I'm not sure exactly what happened. I know he had a procedure done to himself, but it doesn't give details, and I'm left wondering if that's the whole point. Whatever we come up with in our minds might be bad enough, if not worse than what George Daniel Lea intended. Was he getting parts of himself surgically removed? Getting parts of other people stitched onto him? Maybe I just missed it completely, and it's lost within his jumbled rambling! Honestly, this one was just too short for me to get a real feel of anything. I liked the idea, of a neighbourhood having to give their pound of flesh to appease the demon, but I was left with too many questions. Like a flash, it was just over, offering what I felt like very little. I would've loved this had it been longer. In conclusion - There's something here for everyone, but be aware of the pushing of limits. It's not pretty!